My students are moderately excited about our postcard exchange that will be happening this month. I don't think they really understand how SUPER AWESOME this is going to be. I think (and hope) this changes when our postcards come rolling in! I was able to get all of my postcards for half-price (thank you, Chamber of Commerce! ), and one afternoon when we had a few extra minutes, the students stamped and address-labeled the postcards. So if you're in the exchange and notice that your stamp is upside down... I promise it wasn't me, haha! To kick off our postcard exchange, our class took a field trip to the post office. Before we left, we read two books that helped us get in the spirit. We read I Miss You Every Day and Mailing May. 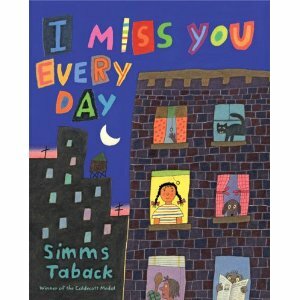 I Miss You Every Day, by Simms Taback, is a cute story about a little girl that misses someone, so she packages herself up and mails herself. It gives a brief overview of the process of mailing something - from dropped it off the post office to putting in the truck, and so on. The illustrations were very cute, and we loved how the girl cut out eye holes and foot holes for herself. It was fun to find her in all of the pictures! 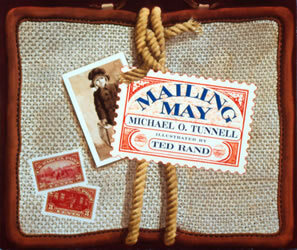 Mailing May, by Michael O. Tunnell, wasn't as big of a hit, but it was still a good book! This was a (mostly) nonfiction story about a girl in 1914 who wants to visit her grandma, but her parents can't afford the train ticket. Due to recent postal law changes, her parents are able to put stamps on her coat and "mail" her to her grandma's house. The pictures were lovely, the kids thought it was an awesome story, but it was a bit on the wordy side, and they didn't understand some of the vocabulary. With a little help from me, it was all good. Then, we made an I Wonder/I Learned chart. I wanted the students to go on the trip ready to ask good questions. They also completed their own Wonder/Learned chart. Our post office is about two blocks from school, so we walked there together. We brought our postcards so we could make sure they made it into the mail! The wonderful man at the post office was very patient with the students and answered many questions that he probably thought were crazy, such as: can girls and boys both deliver mail? What do you do with mail that you can't deliver if the address is too far away? He took us on a tour of the back area, which I thought was really interesting! I forgot to take pictures until we got outside to the lifting device, which he let the kids ride on as he lifted them up and down. Everyone also got to sit in the mail truck! Lastly, we officially mailed off our postcards. We took turns dropped the postcards in the slot and watching them fall into the basket. You would've thought this was the most fun thing they had ever done. They probably could have sat there all day watching mail come in! And the post office was also nice enough to give each student a coloring book about the states! The kids were just beside themselves with excitement. What a great post and fantastic field trip idea. Very exciting! I loved reading this! What a wonderful idea for a fieldtrip--and the kids' questions were too funny! !